Click here to find out more about MDM (Mobile Device Management) systems. Click here to find out what MDM (Mobile Device Management) can and cannot do. First, define 1) What you want to accomplish (grand design). That will clarify details you need to consider, i.e. 2) What devices to use, 3) What applications to use, and 4) What type of security policy to implement. Take an example of an enterprise that wishes to reduce overtime by allowing employees visiting clients directly from/to home without compromising productivity. The enterprise realized that they need to provide access to email system, schedules, contacts, attendance records, business documents, and business reports remotely. The enterprises decided to deploy iPhones from the same mobile carrier as iPhone has the most reliable security. Cost analysis on Android systems was done, but Android 5.1 has not yet provided robust security functions. The biggest security concerns were theft and loss, so the enterprise made a slightly complicated passcode compulsory, and set the devices to wipe their memory in the event of 5 failed passcode attempts in a row. With low IT literacy within the enterprise, the enterprise set restrictions and block access to unnecessary functions. That prevents enquiries from those touching something and causing an unexpected screen to appear. Once the prerequisites have been defined, the enterprise need to move on to the setup tasks. The table below shows part of the BizMobile Implementation Review support service (paid service) document and defines tasks for MDM usage. 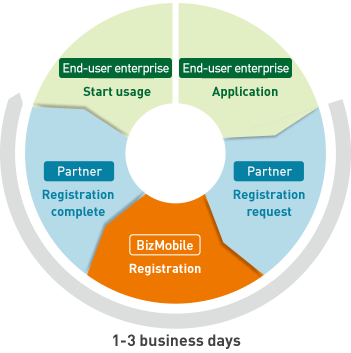 Please refer to the process even when your business is individually reviewing BizMobile Go! features. Type Applicable to No. To do Remarks BizMobile Go! (14) Configuration for each application TeamSpirit, SYNCEL etc. After completing the setup tasks, the next step is to request for a trial. After receiving your application form, registration will be complete in 1-3 business days, and you will be able to download the manual. Follow the manual, complete steps (6) - (14), and review the functionalities. Most companies test 5-10 devices. They review the devices by OS, OS version, and access network type (such as LTE or Wi-Fi), depending on their intended use. Click here for enquires regarding BizMobile Go! After the functionality review is complete, the next step is the implementation/operation review to evaluate how to reduce labor and costs for implementation of the system. In case of large deployment of iPhones, the Apple Deployment Programs (ADP) provided by Apple should be considered. The Volume Purchase Program (VPP) and the Device Enrollment Program (DEP) will simplify the deployment. One note: Check if the carrier or agent supports the DEP. You also need to consider operational issues. Devices with 3G/4G connectivity maintains network connection and information other than secure (encrypted) information can be obtained even during night when the device is in sleep mode. However, settings, applications, and books will be distributed once an employee unlocks the lock screen in the morning. According to statistics, devices such as iPhones access the network mainly during morning hours when users unlock the screen. Especially, Wi-Fi devices are unlocked when office hours commence, so they typically access the system during the first 30 minutes after office hours commence. Hence, you cannot configure or install applications for smartphones and tablets overnight. For deploying a large number of devices, it is necessary to choose an MDM that has no problems during operation. BizMobile Go! is able to distribute even a large number of applications without a hitch. To perform implementation/operation reviews to evaluate the most suitable policy for your business, smaller scale deployment i.e. for only IT department or other specific departments is recommended to elucidate operational issues. Such a review is only necessary for large-scale implementation, but if you are considering implementing 100-1000 devices and that wish to conduct a review, we will introduce you to the most suitable partner (including private partners) for your case. In addition, you may also use the BizMobile Implementation/Operation Review support service (paid service) as necessary. Enterprise planning for more than 10,000 devices will require additional steps at the beginning of implementation. In order to isolate problems, the devices will be deployed in batches over a few days. We have a list of partners (including private partners) capable of handling such cases. In addition, you may also use the BizMobile Implementation/Operation Review support service (paid service). We are ready to support your business in various ways, including monitoring the implementation status, and providing immediate response to problems, so please feel free to consult us. Support for renewal of expired certificates etc.